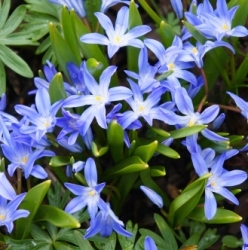 Chionodoxa ('Glory of the Snow') self-seed freely under trees or shrubs and are one of the earliest bulbs to bloom in the Spring. They are excellent for rock gardens, in the front of raised beds, or they can be forced indoors. Excellent naturalizers. Watch out for slugs! Chionodoxa Forbesii are also known as ‘Glory of the Snow.’ They have 6 to 10 star-shaped lilac flowers with a white center on slender stems. Good for forcing. Early bloomer. 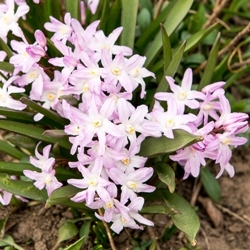 Chionodoxa Pink Giant are star-shaped and have sturdy stems of violet-pink flowers with a white center. Chionodoxa Gigantea Alba. 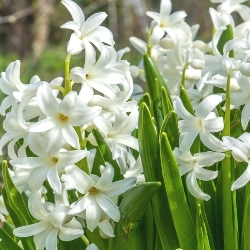 Also known as ‘Glory of the Snow’ they have 6 to 10 star-shaped pure white flowers with yellow centers on each stem. This is a mixture of our blue, white and pink Chionodoxa.